This art journal piece popped into my head as soon as I read the prompt. I am a die hard Nickleback fan and have followed them since I heard CURB. <3 them! This song hits at the core of who I am and wish I could be better about being! Coming together as a whole is always better than a part or a single person. I started this art journal with gesso, once dry I turned the book upside down and wrote the lyrics in a water soluable solution so that when sprayed it would distort, similar to jotting down a poem or letter on the fly. Then i sprayed the work with tattered angels mist in green and blue. The lyrics were written upside down as I feel that is the state of the wold at present on this issue. The challenge also wanted to see paper piecing; however, I used material instead. I free hand cut the "world" and continents. Then I cut the heart out of felt. One of my favourite parts of the song is toward the end when Chad Kroeger sings: And the drumbeat carries on, echoes from Ryan Peake, Mike Kroeger and Joey Moi? (Just like a heartbeat)....and in true rockband essence, my heart has wings....lol. The various coloured hands represent the diversity of the world coming together to help the world stabilize. 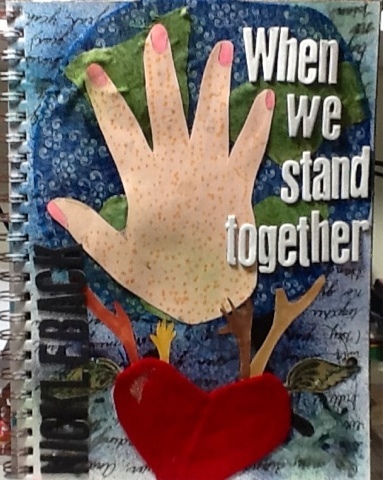 My hand is the most present as it is my art and interpretation of the song: When we stand together.